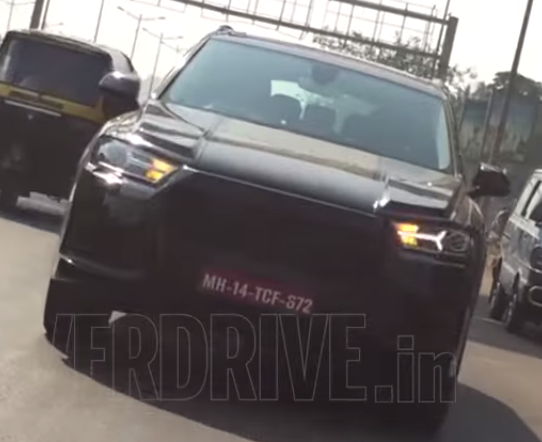 Barely 15 days after Audi released the pictures of next generation Audi Q7, a test mule has been spotted in India amid heavy camouflage. Audi will officially launch the new Q7 at Detroit Motor Show in March 2015 and will be in Indian showrooms by middle of 2015. The next generation Audi Q7 is less bulky and more squarish with bold straight lines flowing through the body. Audi Q7 retains its muscular look with its bulging wheel arches, a highlight of the current Q7 as well. There is new front grill which has been slightly redesigned and is in line with the latest Audi Q3. The new Audi Q7 weighs 325 Kg lesser than its predecessor and now stands at 1970 Kg. Audi engineers have cut down weight of about 100 Kg from the suspension, 71 Kg from the body and 24 Kg by adoption aluminium doors. The new Audi Q7 is bigger inside as well compared to the current model.